As a politically stable and developed nation with mature infrastructure, large pipeline networks and rail transport in place for the transportation of oil and gas, the United States provides one of the most attractive environments for oil and gas companies in the world. The US oil and gas scene is a particularly favourable environment for small operators, thanks to a peculiar system of property rights in the USA. 1 (See "Federal, State and Fee Leases" section below) Given this, it is unsurprising to find that a number of listed Australian energy companies have gravitated towards the onshore oil and gas fields of the US. The depressed energy prices over the past couple of years have adversely impacted sentiment towards the oil and gas sector, and Australian oil and gas companies operating in the US have not been immune. The share prices of most of these companies are currently sitting near multi-year lows. In recent months, however, there have been some indications which suggest that mood towards this sector is improving. Two Australian energy companies based in the US -American Patriot Oil & Gas (AOW) and Sundance Energy (SEA) - have become takeover targets this year. It is also worth noting the July debut of Australis Oil and Gas (ATS) onto the ASX, the first new Australian company to enter the North American oil space in two years. Now could be the time to pay closer attention to energy companies focused on this region. Below I examine several Australian stocks operating in the United States, with the focus primarily on the undeveloped lease acreage controlled by these companies, as the value of this acreage may not be fully reflected in the share price of these stocks. There is also some reason to believe that large lease acreage positions may become increasingly difficult to acquire in the US, for reasons to do with the current political environment. In the United States, ownership of mineral rights can be held by private individuals or State and Federal governments. Oil and gas companies identify the owners of the minerals and negotiate a lease to allow the companies the right to explore for oil and gas. The most significant owner in the US is the Bureau of Land Management (‘BLM’), which manages almost 700 million acres of sub-surface mineral estate, more than any other government agency. In addition to Federal leases, there are also State Leases and Fee Leases (privately owned). With Fee Leases, the company negotiates directly with the individual landholder, and as such Fee Leases generally have fewer environmental restrictions than Federal or State Leases. Fee Leases predominate in the Eagle Ford and the Permian Basin of Texas, whereas most of Niobrara and the Bakken are covered by State and Federal leases. Over recent years, political forces have served to increasingly restrict the release of land available for oil and gas exploration and extraction, a trend largely driven by rising environmental awareness. Unsurprisingly, the fracking issue regularly dominates local politics and media in the United States. The subject has come up in the current US election campaign. Donald Trump has broken with many state Republicans and the oil industry, suggesting during a recent interview that local communities that are against fracking should have a say in the matter. The table below shows the number of acres offered at lease sale auctions and the number of acres sold by the BLM from 2012 to 2015. Around 11% of the gas and 5% of the oil produced in the United States is from Federal onshore oil and gas wells 7, so the recent drop in lease acreage release by the BLM is likely to put a dent in future oil and gas production in the United States. The tardy release of acreage by the BLM for oil exploitation in recent years reflects the pro-renewable energy stance of the US Democratic Party. Low energy prices have served to hinder the shift away from fossil fuels (for example, sales of plug-in electric vehicle flat lined in the US after the oil price crash 8) and so paradoxically, in the short term higher oil prices are as much in the interest of the US Democrats as it is for smaller US oil companies. In practice, the relationship between the Democrats and the US oil industry is an ambiguous one: President Obama has presided over the largest increase in oil production in US history9, which has reduced the dependence of the US on foreign oil and helped boost the US economy after the GFC. Given the importance of the local oil and gas industry, it would appear that Obama and Clinton have adopted a ‘grandfathering’ approach to fracking, limiting the spread of the technique into new areas rather than enacting broad-brush restrictions. Thus, in the short to medium term, the controversy over fracking may actually be a positive for companies currently holding oil and gas lease acreage in the US. The restriction on the land releases by the BLM may help pave the way for a ‘choke’ in future oil supply in the United States, and so it is plausible that companies controlling oil lease acreage may find that they are sitting on an increasingly scarce and valuable asset in the event of a sustained oil price recovery. The table below shows the size of the lease position of US focused ASX listed Australian oil and gas companies, as well the approximate Australian dollar-per-acre value of the lease holdings for each stock. Each dollar-per-acre figure has been determined by calculating the enterprise value of the company divided by the total number of acres held by the company, using the figures from the most recent financial reports (the dollar-acre values have been rounded to the nearest $5). The table above is not comprehensive: two companies not included here are Red Sky Energy (ROG) and Black Star Petroleum (BSP) due to the extreme illiquidity of these two companies. One thing that stands out in this table is the significant divergence between the per-acre valuations of the companies focused on Niobrara or the Bakken and those controlling acreage in the Eagle Ford in Texas or Oklahoma. Given the current low oil price environment, that fistful of dollars saved in per barrel production costs by the operators in Texas and Oklahoma could make all the difference, and it would appear that investors are willing to pay a premium for the companies in the low-cost areas. The value of lease acreage in the US can thus vary widely, depending on the location, the lease type, and how well developed the land is, to name a few variables. 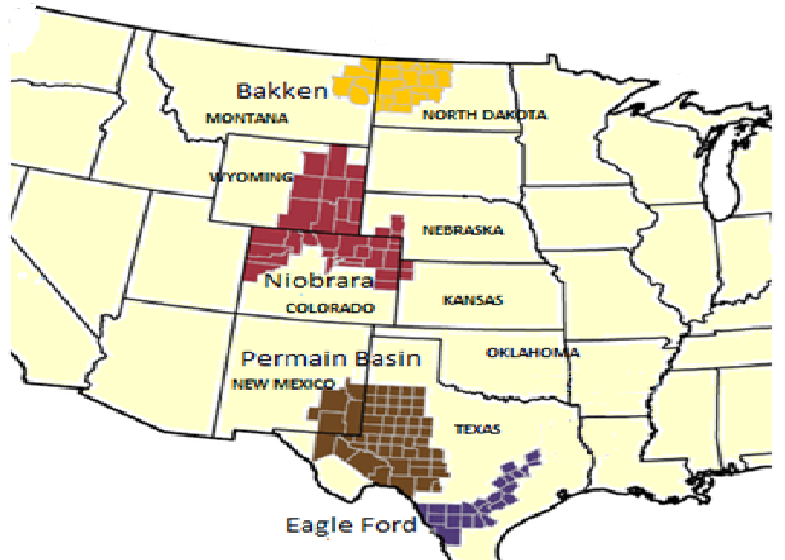 Above: US oil and gas regions mentioned in this article. For purposes of comparison, I’ve included below the most recent available data on lease valuations from the BLM website (up to September 2015). In the table below, I’ve calculated the US dollar per acre paid for each transaction in each location (rounded to the nearest dollar). There is a wide range here, from as low as $4 per acre to $2843 per acre. The average is $498 per acre, although given the wide range the average figure would only be relatable to a company with acreage spread across various locations such as American Patriot. It is a reasonable supposition that the acreage held by the listed Australian companies would typically be worth more than the dollar-per-acre bids at a BLM auction, as Australian companies in the US would only be targeting the most promising locations. The recent takeover bid for American Patriot by Running Foxes Petroleum supports this assumption. The offer was for 22c per share, which would put the AUD dollar value of the company acreage at around $1100, or just above $800 USD at the current exchange rate. Both of these takeover offers suggest that the current share price of most of the US focused oil and gas stocks may not be accurately reflecting the true market value of their leasehold acreage positions. Given this, it is intriguing to note that some of the executives behind Aurora have now gotten behind a new project, Australis Oil and Gas, which listed in late July. Alexis Clark, the MD of American Patriot, was formerly an oil and gas research analyst, and so would be well acquainted with the assets of the Australian companies operating in the US. It would thus not be unreasonable to consider that some of the local Australian oil and gas stocks based in the US could become targets. Note: this is a general overview of the subject examined above rather than an in-depth financial analysis, and so as always, do your own investigation into these stocks before committing to any course of action. 14) American Patriot Oil & Gas, investor presentation, 21/7/14. 15) Australis Oil and Gas Prospectus, pg 9, 21/7/16. 16) American Patriot Oil & Gas announcement, pg 1, 29/7/16. Thanks for taking the time to share this Patrick, it was a pleasure to read. Thanks Patrick. One thing I should mention is that although the $ per acre valuations of each of the stocks was calculated several weeks ago, the share prices of the six companies has not changed much since then: Sundance Energy (up about 10%) and American Patriot (down about 20%), are the two exceptions.